Unfortunately Jacksonville Florida suffers the same fate as the rest of Florida and the Western Atlantic. The waters offshore northeast Florida are plagued with invasive lionfish. TISIRI and Offshore Dive Charters are coordinating lionfish round-up events to do as much as possible to try to keep the lionfish population in check. See the brief video of one of our lionfish round-up events below. 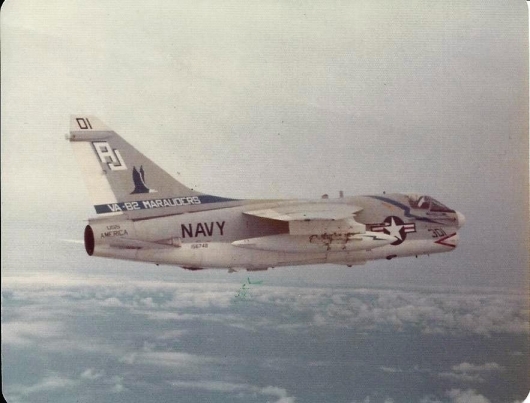 On a cold winter day in December of 1974, two A7-C jets collide at 15,000 feet offshore St. Augustine. One of the A7's quickly becomes uncontrollable and falls out of the sky into the ocean below. The other aircraft is able to limp its way home. Nearly 40 years later, the TISIRI team finds themselves investigating aircraft wreckage off the Coast of St. Augustine Florida. Scuba diving searches of one wreckage site has revealed what appears to be large aluminum metal structures and large tires. Structures that are often associated with military aircraft. The TISIRI team continued investigation efforts at the two offshore wreckage sites offshore St. Augustine. This post is in regards to wreck site 1, the area that has two Lycoming engines buried in the sea floor. Today one of the engines was lifted out of its buried state with the use of a heavy duty lift bag. This allowed TISIRI investigators to confirm the engine contained a 2 bladed propeller while revealing a stamped number near the propeller blades. Hopefully these features will help identify this aircraft. See pictures below and make note of the stamped number in the propeller picture. Please let us know if you can help us further id this aircraft with this new information. CNN News publishes a story in regards to TISIRI's aircraft wreckage investigation. The article describes the story of pilot Stewart Dunbar who went missing after a flight 16 years ago. Dunbar's family has been searching for him ever since and immediately contacted TISIRI after hearing of the recent aircraft wreckage discovery. Read the story by clicking on the image of Ed Kalakauskis and Joe Kistel surveying the wreck site below. Even though TISIRI is largely focused on man influenced marine habitats we are also very interested in natural reef systems. When possible, we visit such areas for comparison and observational purposes. The hope is that man influenced marine habitats, such as those created as a result of artificial reef deployments, mimic natural reefs systems as much as possible.TISIRI investigated one such natural reef this past Sunday. This area, which is often referred to as live bottom, consisted of a 4 foot relief stone ledge in about 80 feet of water. Below are pictures from TISIRI's reef investigation. The visibility was far from ideal when these pictures were captured but the photos demonstrate the current condition of the reef fairly well.